Burned out and depressed. This described me very well in 2005. I was in ad sales, in my mid-30s and had given up on my dream which, if you didn’t guess, was not ad sales. Then, one day, I heard about something that saved me professionally and, in many ways, personally. It was…well, I’ll get to that in a minute. I have a #1 Best Seller on the Amazon Kindle. I have a dedicated user community that spans most English speaking countries. I am making a living doing something I love while incorporating my 20 years of business experience. I was just interviewed on a nationally syndicated radio show with 570 affiliates to talk about my book and my success. My “product” has been downloaded over 10 million times since 2010, and is most popular of its type on the Internet. I can’t believe all of this is happening to me after almost giving up all those years ago. Yes, things have changed considerably in 8 years and the reason why comes down to one simple word: Podcasting. For those unfamiliar, podcasts are typically on-demand audio programs (though some are video) that can be listened to for free via iTunes and many other apps. With the proliferation of smartphones, the ease of accessing podcasts is light years beyond what it was eight years ago when I started. Podcast listening is growing in popularity every day. According the 2013 Infinite Dial study by Edison Research, an estimated 32 million Americans have listened to a podcast in the last month. My surmise is that these people are in higher SES categories than the average person which has obvious benefits to marketers, etc. Long story short, I started a podcast on a subject that fascinates me. I began as a hobbyist but now podcasting has turned into my full time job and given me the opportunity to become a published author. I’ve gone from a very depressed man who thought his professional life had passed him by to someone who can’t wait to get to his desk each day. To be clear, I am not suggesting that you ditch your current career and leave it all to become a carefree podcaster! My message to you is that podcasting, regardless of your walk of life, is a great way to market your personal brand and enhance the success of whatever it is that you do. While it might not become a full time job, and doesn’t need to be, it can become the conduit to increased stature in your business and a healthier bottom line. All of this can be done by investing a little spare time and a bit of sweat equity. What do I mean by that? It is my proposition that if most people needed a cardiothoracic surgeon (Dr. Oz’s specialty), the vast majority would choose Dr. Oz over another surgeon solely due to his celebrity. FYI, if you are reading this Dr. Oz this is not a knock on your skills, I am sure you are a fantastic surgeon. Hosting an audio podcast on a niche subject can raise you to the level of expert on your given topic. It may not be quite at the Dr. Oz level, but the benefits can be substantial. Also, the networking benefits of being a sought-after host of a successful program are innumerable. You get the picture. Enhanced credibility leads to more leads, which at the risk of overusing the word, leads to more sales which leads to more money for you! The great news is that audio podcasts can be produced with a very small budget (I started out with a $50 headset and a PC). Plus, once you get rolling you can expect to spend an hour or two a week producing a quality show including bookings, recording, etc. A willingness to learn, a couple of hours a week, some elbow grease, and maybe a couple hundred bucks invested in equipment…sounds like a pretty good tradeoff to become “your own Dr. Oz.” So, grab a mic and get started. It worked for me! If you want to learn more about Jim’s upcoming online class on podcasting visit PodcastWithJim.com. 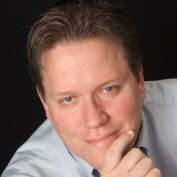 Jim Harold is the President of Jim Harold Media LLC, and the host of numerous podcasts on the paranormal. He is America’s favorite paranormal podcaster. You can find his programs and books at JimHarold.com.